Electro-acoustic guitar with a dreadnought body shape with cutaway from Hot Rod Design Acoustics series. Body and sides of the instrument are made of mahogany with mahogany binding, top is made of quilt maple wood with gloss finish and quartersawn scalloped X bracing. “C”-shaped mahogany neck with a gloss finish is fitted with 11.81”-radius rosewood fingerboard with 20 frets and dot inlays. Scale length is 643 mm, nut width is 41.3 mm. Guitar further features a Fishman Isys III pickup system with active on-board pre-amp, built-in chromatic tuner, on/off switch, 3-band EQ and Volume control. Instrument is further equipped with a rosewood bridge with GraphTech Nubone compensated saddle, a GraphTech Nubone nut, chrome hardware, and Fender Dura-Tone Coated 80/20 Bronze strings (gauge: .012-.052). Transparent Blue colour design. 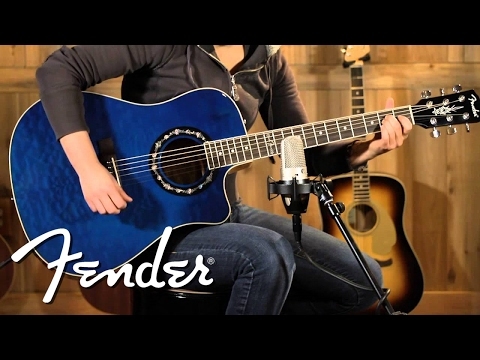 Do you own Fender T bucket 300CE Transparent Blue or have you had a chance to try it? Egyszeruen imadom. Tokeletes kialakitas, gyonyoru hangzassal parositva. Biztonsagos szallitas. Tok, kabel, pengeto nincs hozza.